A team sport includes any sport where individuals are organized into opposing teams which compete to win. Team members act together towards a shared objective. This can be done in a number of ways such as outscoring the opposing team. Team members set goals, make decisions, communicate, manage conflict, and solve problems in a supportive, trusting atmosphere in order to accomplish their objectives. Examples are basketball, volleyball, rugby, water polo, handball, lacrosse, cricket, baseball, and the various forms of football and hockey. Team sports are practiced between opposing teams, where the players interact directly and simultaneously between them to achieve an objective. The objective generally involves teammates facilitating the movement of a ball or similar object in accordance with a set of rules, in order to score points. The meaning of a "team sport" has been disputed in recent years. Some types of sports have different objectives or rules than "traditional" team sports. 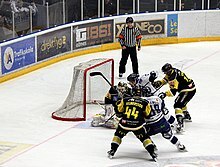 These types of team sports do not involve teammates facilitating the movement of a ball or similar item in accordance with a set of rules, in order to score points. For example, swimming, rowing, sailing, dragon boat racing, and track and field among others can also be considered team sports. In other types of team sports, there may not be an opposing team or point scoring, for example, mountaineering. Instead of points scored against an opposing team, the relative difficulty of the climb or walk is the measure of the achievement. In some sports where participants are entered by a team, they do not only compete against members of other teams but also against each other for points towards championship standings. For example, motorsport, particularly Formula One. In cycling however, team members whilst still in competition with each other, will also work towards assisting one, usually a specialist, member of the team to the highest possible finishing position. This process is known as team orders and although previously accepted was banned in Formula One between 2002 and 2010. After a controversy involving team orders at the 2010 German Grand Prix however, the regulation was removed as of the 2011 season. Through the years, the popularity of team sport has continued to grow, positively influencing not just athletes, but also fans, local and national economies. All over the world, the impact of team sport can be seen as professional athletes live out their dreams while serving as role models, youth athletes develop life skills and follow in the footsteps of their role models, fans bond over the love of their teams while supporting their economies with their support. Traces of sprinting as a team sport extend back several thousand years - as evidenced in images in the cave in Lascaux in France which depict people running after animals or vice versa; this was an issue of survival of the fittest. Organized athletics in Greece traditionally date back to 776 BC, with ongoing activity recorded up to 393 BC. These ancient Olympic Games tested warrior skills and consisted of running, jumping or leaping, wrestling (combat sport), and javelin throw. In the Bayankhongor Province of Mongolia, Neolithic-era cave paintings dating to 7000 BC depict a wrestling match surrounded by crowds. Prehistoric cave-paintings in Japan show a sport similar to sumo wrestling. In Wadi Sura, near Gilf Kebir in Libya, a Neolithic rock painting in the cave of swimmers shows evidence of swimming and archery being practiced around 6000 BC. The present-day pattern of Olympic Games resembles the practice followed in ancient times. Sprint was the coveted event. The 200 m sprint is known in Greek as "short foot race". The 400 m race is equivalent to two stades and called diaulos in Greek. Seven team sports are currently on the program of the Summer Olympics. Cricket's inclusion in the 2024 Summer Olympics depends on the decision of the International Cricket Council and its members. 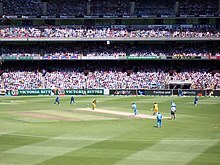 A cricket tournament formed part of the Summer Olympics in 1900, although only one match was played, between teams representing Great Britain and France. However, the British team was effectively a club touring side and the French players were drawn partly from expatriates living in Paris. Ice hockey and curling are team sports at the Winter Olympics together with the bobsleigh competition where the men's event has classes for both two-man and four-man sleds, but the women's class is restricted to two persons only. All Olympic team sports include competitions for both men and women. Wikimedia Commons has media related to Team sports. Look up team sport in Wiktionary, the free dictionary. ^ Baofu 2014, p. 202. ^ "2008 FIA Formula One Sporting Regulations" (PDF). Retrieved 21 October 2018. ^ "2010 FIA Formula One Sporting Regulations" (PDF). Retrieved 21 October 2018. ^ Barber 2006, p. 25. ^ a b Barber 2006, p. 26. ^ Hartsell, Jeff. "Wrestling 'in our blood". Bulldogs' Luvsandor. Retrieved 25 October 2015. ^ Robert Crego (2003). Sports and Games of the 18th and 19th Centuries. Greenwood Publishing Group. pp. 34–. ISBN 978-0-313-31610-4. Retrieved 25 October 2015. ^ Győző Vörös (2007). Egyptian Temple Architecture: 100 Years of Hungarian Excavations in Egypt, 1907– 2007. American Univ in Cairo Press. pp. 39–. ISBN 978-963-662-084-4. Retrieved 25 October 2015. ^ Compare: Harper, Douglas. "athlete". Online Etymology Dictionary. Retrieved 2018-05-30. "athlete (n.) early 15c., from Latin athleta 'a wrestler, athlete, combatant in public games,' from Greek athletes 'prizefighter, contestant in the games,' agent noun from athlein 'to contest for a prize,' related to athlos 'a contest' and athlon 'a prize,' which is of unknown origin." ^ "Cricket edges closer to Olympic roster". AFP. 11 February 2010. Archived from the original on 15 August 2012. Retrieved 13 February 2010. ^ "Cricket at the 1900 Paris Summer Games". sports-reference.com. Retrieved 19 October 2015. ^ "BOBSLEIGH". International Olympic Committee. 2015. Retrieved 23 October 2015. ^ Sport, ComeOn. "Sports Tours and tournaments in France and Europe - ComeOn Sport". ComeOnSport. Retrieved 21 October 2018. Baofu, Peter (17 October 2014). The Future of Post-Human Sports: Towards a New Theory of Training and Winning. Cambridge Scholars Publishing. ISBN 978-1-4438-6993-5. Dyer, William; Dyer Jr., William; Dyer, Jeffrey (2007). Team Building: Proven Strategies for Improving Team Performance. San Francisco, Ca. : Jossey-Bass. ISBN 978-0-7879-8893-7. Hanlon, Thomas (2009). The Sports Rules Book: Essential Rules, Terms, and Procedures for 54 Sports. Champaign, Il: Human Kinetics. ISBN 0-88011-807-5. Hiltscher, Julia; Scholz, Tobias M. (6 October 2015). eSports Yearbook 2013/14. BoD – Books on Demand. ISBN 978-3-7386-4981-9.